Describing the topology of networks of seed circulation is interesting since it gives insight on how exchanges are organized within a PPB programme or a Community Seed Bank(Vernooy, Shrestha, and Sthapit 2015)(Pautasso et al. 2013). Analysis can be done at several geographical or organizing scales, for example local, regional or national. a seed lot (i.e. a combinaison of a germplasm in a given location a given year) and edges are relationships such as diffusion, mixture, reproduction, crosses or selection for example. The workflow is very simple as only descriptive analysis can be done based on network format (Figure 2.1). 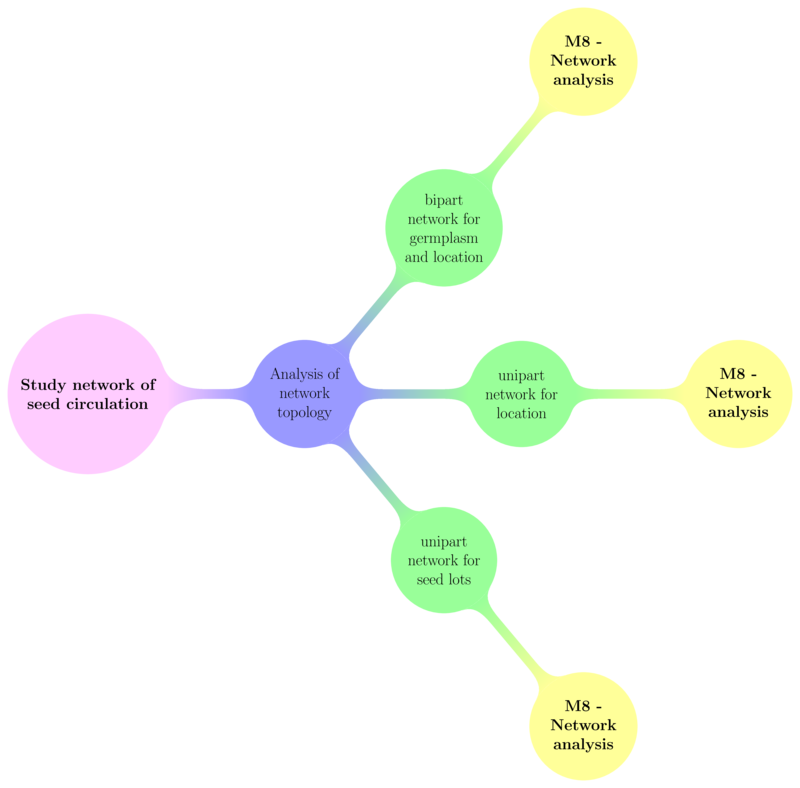 Figure 2.1: Decision tree with objectives and analysis carry out in PPBstats regarding network analysis. M refers to methods. Figure 2.2 displays the functions and their relationships. Table 2.1 describes each of the functions. Figure 2.2: Main functions used in the workflow. Table 2.1: Main function descriptions. Possible options are : "long_parent", "lat_parent", "long_child", "lat_child" to get map representation, supplementary variables with tags: "_parent", "_child" or "_relation". unipart networks that represent relationship of germplasm diffusion between locations: a data frame with the followin compulsory columns (same as above): "location_parent", "location_child", "relation_year_start", "relation_year_end". Possible options are : "germplasm_parent", "year_parent", "germplasm_child", "year_child". Other possibles option are : "long_parent", "lat_parent", "long_child", "lat_child" to get map representation. Note that format 1. can be convert to format 2. and 3. as summarized in Table 2.2. When bipart network come from unipart network for seed lots, relation reproduction and diffusion are taken. Table 2.2: Possible analysis (in column) regarding network format (in row). The format of the data are checked by the function format_data_PPBstats(). network_part : "unipart" or "bipart"
for unipart network : "seed_lots" or "location"
network_split : for network_part = "unipart" and vertex_type = "location", split of the data that can be "germplasm" or "relation_year_start". Possible values of argument regarding network format are displayed in Table 2.3. Table 2.3: Possible values of argument (in colum) regarding network format (in row). The following sections give exemples for each network format. The function returns list of igraph object1 coming from igraph::graph_from_data_frame(). For network_split = "germplasm", it returns a list with as many elements as germplam in the data as well as all germplasms merged in the first element of the list. For network_split = "relation_year_start", it returns a list with as many elements as year in the data as well as all years merged in the first element of the list. ##  "2007-2008-2009" "2007"           "2008"           "2009"
For bipart network, it returns a list with as many elements as year in the data as well as all years merged in the first element of the list. If no year are provided into the data, all information are merged.